Osprey Renn 65 Backpack for Women is from a completely new 2019 series, a quality yet affordable pack with an adjustable torso size and rain cover included. Osprey Renn 65 Backpack for Women front view. Excellent ventilation with a trampoline style mesh back panel. Attachment for Osprey Daylite and Daylite Plus packs. This pack is currently available on Amazon at a really great price, and they have the best shipping conditions. This Renn 65 is the larger pack from the new mini-series of two that also includes a 50-liter pack. They launched it parallel to the corresponding Rook 50 and Rook 65 packs for men. This is a series that comes with a few features less than the other Osprey’s packs of this size, and the prices are more affordable. But this is still a top quality product with a number of useful features as you would expect from Osprey. 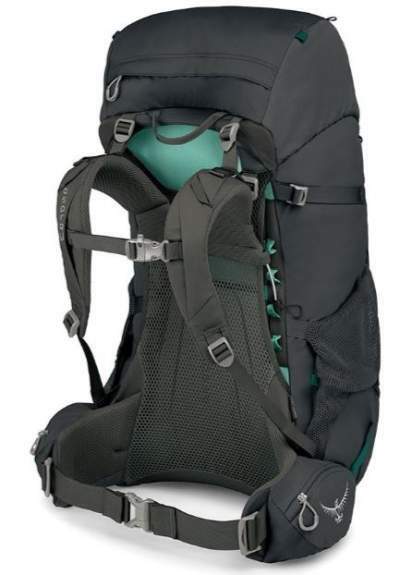 This is a very lightweight pack and by this I mean that the volume/weight ratio is around 42 liters/kg, which is an extraordinary great value. You might want to compare this with their another pack which is built to be ultra-lightweight, the Osprey Eja 58 where this ratio is around 49 liters/kg, but many necessary features are missing in this pack. 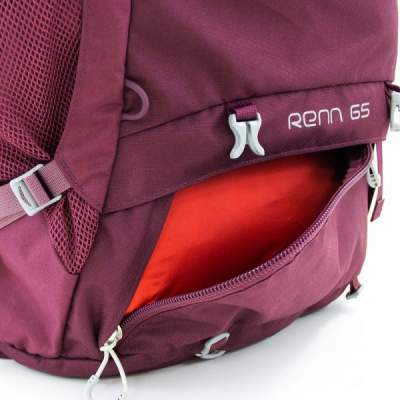 The Renn 65 is a top loading pack with a classic lid and a collar underneath it. It comes with a sleeping bag compartment as well, and the divider between the two is with two buckles so you can detach it partially and get into the main compartment from the bottom as well. The pack comes with a bonus rain cover which has its own dedicated pocket on the bottom, see the picture. The reservoir sleeve is inside the main compartment. The rain cover is included. There is a separate bottom compartment. The suspension is the most important segment of such a big pack so here you have a fully adjustable torso size and a nicely padded hip belt. The torso adjustability system is a quite unique ladder-type. It includes two loops and locking bars on the sides, see the picture below, and the harness slides up and down along the side rails. It is supported by the LightWire peripheral frame which transfers the load to the hip belt. Apart from adjustability, the best part of this is the AirSpeed tensioned trampoline-style mesh which offers the best possible ventilation. It is the same type as in their Levity & Lumina or in the new Exos & Eja packs. But the hip belt is well padded here and this is what makes it much better than the mentioned series. The zoomed view of the unique ladder-type torso adjustment system. As you realize from the picture above, this system allows for several discrete positions for the torso length. So this is not a continuous type which you have in the packs with Velcro hook-and-loop connection. But you can still do some fine tuning with the shoulder straps and you will be able to set the hip belts in its optimal position. Note also that they have built two attachment positions for the load lifters, this is necessary if you move the torso attachment far in any of the two directions. Repositioning the load lifters allows you to better stabilize the pack. The shoulder straps and the hip belt are well padded and there is nothing one could object here. The rail-type sternum strap is in place and it comes with an emergency whistle. There are 5 pockets in total. Two zippered pockets are on the hip belt, one is visible below, so again compare this with their new Exos and Eja series where you do not have them. 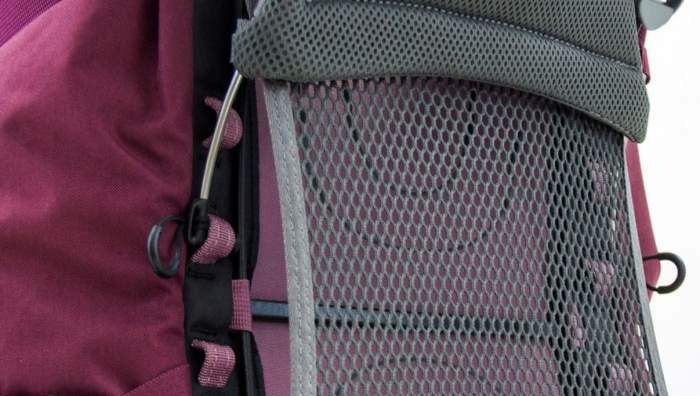 On the sides you have the usual stretch mesh pockets with dual entry points, from the top and from the side. One large zippered pocket is on the lid, it is shown below. You have dual compression straps on each side, so this is all as it should be. The lower are directly connected with the hp belts, quite unusual and I am not sure if this is the best option. 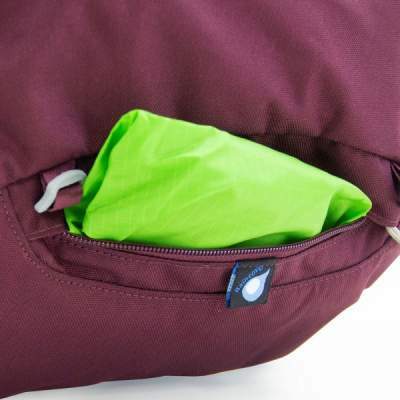 On the bottom, you have dual removable straps where you can attach a sleeping pad or tent. There are 4 attachment loops on the lid, some are visible in the picture above, so here you can attach various stuff with the help of extra cords. The front is a completely empty area. But they have added webbing loops where you can attach Osprey’s daypacks i.e., the Osprey Daylite backpack and Osprey Daylite Plus. You have this feature in several large series of Osprey. Unique torso size adjustment system. Weight: 3.44 lb (1.56 kg). Dimensions (L x W x D): 26.4 x 14.6 x 14.2 in (67 x 37 x 36 cm). I always think it is a good idea to compare the features of packs. This is a way of understanding them better and you will know what you get for the money. So here I give this Renn 65 side by side with two top-notch packs for women from two renown brands. I would say it stands well with those two great packs, but the price differences are considerable, this is a far more affordable pack than the other two. Please follow the links for more. 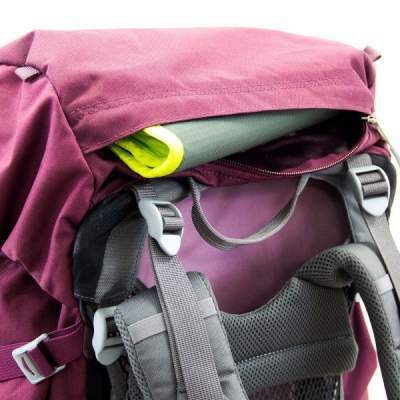 In the summary, this Osprey Renn 65 Backpack for Women is really nicely built. Its best features are: a) the adjustable shoulder harness with the best possible ventilation, and b) excellent volume/weight ratio. There are packs with a larger volume/weight ratio, but as you can imagine, this always goes with a lack of features. I do miss a few details in this Renn 65 as well, but it is worth the money. I see it best suited for travel (you can attach smaller Osprey’s daypacks) and also for hiking and backpacking. If you are on a budget and want a top quality item, this is it. 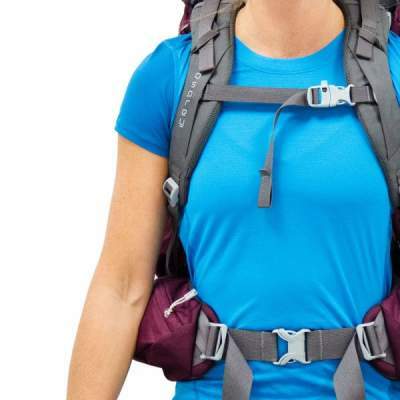 I have included it in my list of best women’s backpacking packs. If you need more options, please check my page with packs in the volume range above 55 liters. You will find all the top models presented in detail. You might want to compare this pack with the new version of Viva 65 pack for women. 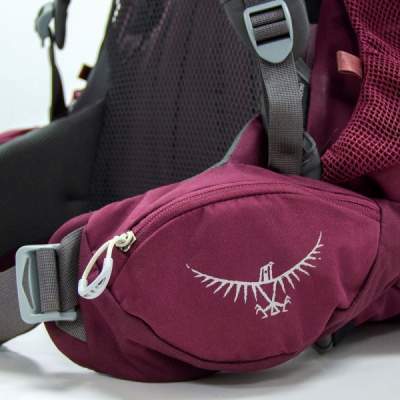 Check also my comparison text Osprey Rook & Renn vs Osprey Exos & Eja backpacks. Note that this is not a sponsored post. I am not paid by the brand and I am not related to them in any sense. Please use the comment box below in the case of questions or comments. Have a nice day.